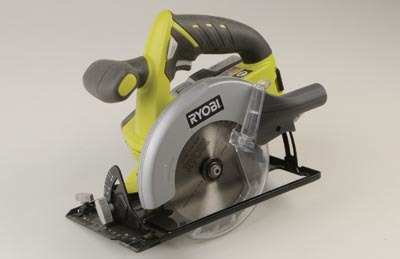 New on the market is this budget priced cordless circular saw from Ryobi's One+ range which I was keen to test. In my opinion, good as Li-ion battery power is, it still does not allow prolonged use of a circular saw. Fortunately, however, battery charging times are considerably less than they used to be, so things are looking up, and I managed to get quite a lot done with the One+. An 8 x 4ft sheet of 12mm ply was quickly reduced to several component parts, before charging across a 40mm-thick oak worktop. Not bad going, but I did have to drop the tempo to a gentle stroll for the last couple of inches. 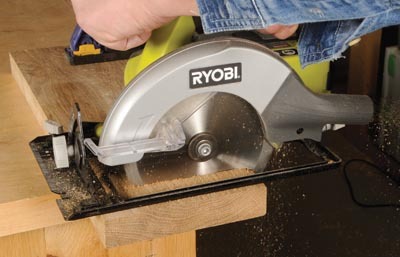 The One+ circular saw is one of a list of about 15 tools from Ryobi that have been developed to use the same 18V Li-ion battery system. The thinking behind this is surely that we would only want to use one tool at a time. In many cases this is true, but perhaps not for the pro. As a lightweight handy device for reducing sheet material, this machine is more than adequate. A complete One+ system would make perfect sense for the small workshop, especially with the 6-way multi charger. But pros should stick to the more expensive Makita kit.